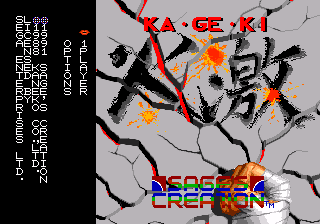 Ka-Ge-Ki (火激), sold as Ka-Ge-Ki: Fists of Steel in the US, is a 1991 action game developed by HOT-B for the Sega Mega Drive, ported from an arcade game and arranged in certain aspects, made by Taito and Kaneko in the year 1988. The player character is Ken, a boxer who's girlfriend was captured by a gang of criminals and taken to the ninth floor of their hideout. Ken must defeat every enemy to rescue his girlfriend. The player fights through 9 stages, represented as floors of a building. In each stage, the goal is to defeat a certain number of enemies that attack the player one at a time. The number of enemies that appear is based on the stage and difficulty level. After enough opponents are beaten, a boss appears. After the boss is defeated, gameplay continues on the next floor until the final boss is defeated on the ninth floor. Gameplay takes place in a small, square arena, where Ken and his opponent are free to move in all directions. Ken has a fast and a strong punch used to attack enemies, and can also jump to avoid enemies. Occasionally, one of three kinds of power-ups will appear in the arena, these will restore Ken's lost health or increase his attack power for a limited time. Voice data is different between the Japanese and US release. Compared to the Arcade version, there are some significant differences, making this version an arranged version rather than a straight port.